I safely slept my way across the country and Claudia and I are planning to drive up to Rhinebeck today. Because carrying a 3/4 complete sweater as a travel project seemed silly even to me, I unearthed some unfinished plain vanilla socks to finish up during the trip. 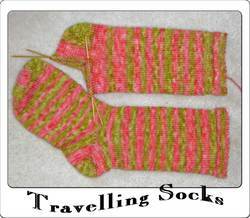 This lovely sock yarn is from Twisted’s etsy shop and is super. I’m using my standard picot hem and shortrow heel and toe. Easy. The cool colorway notches up the plain sock. So we’re on the road and hopefully these will be worn at the festival!